While the race between teammates, Bhanuka Rajapakse and Ramith Rambukwella of Royal College is hotting up in the All Island contest, of the Observer/Mobitel Most Popular Schoolboy Cricketer Contest, there was a major change in the Outstation category when the captain of Dharmaraja College, Kandy Hemal Munaweera who was originally not in the running, entered the competition polling over 7000 votes to be placed at number 8. He has pulled 7,599 votes. K. Gamage of Vidyartha College, Kandy went two steps up to be placed at number 6 with 14, 229 votes at the end of count number 11 in the outstation regiment of the contest 2011. In the Outstation category, St.Servatius' Sanjika Ridma who took the top spot last week, has been pushed down to number two by Royal Panadura's Dushan Vimukthi, who occupies the top spot with 35,071 votes. Ridma is presently second with 34,998 and Maris Stella's Chatura Dilshan is presently third with 34,623 votes. The top three in the Outstation section have all got a chance of hitting the top spot. 1. Rs. 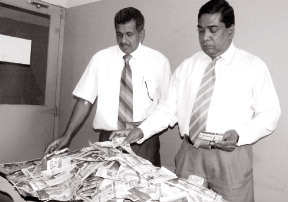 2,500.00 - Gamini Werellagama, 23/1 A, Vidyala Mawatha, Nugawela. 2. Rs. 1,500.00 -Naleef Brian, No. 4, 1st, Lane, Ampara. 3. Rs.1,000.00 - K.P. Jayawardena, 7/2 Ruwanpura, Matara. 1. Matheesha Buddi, Sanghabodhi College, Gampaha. 2. Dinusha Rupasinghe, 36/1, Amunugoda, Imbulgoda. 3. O.B. Jamaldeen, 19/10 A, Galwala Para, Pitakotte. Only the winners of T-shirts please call over on a week day at the ANCL reception to collect your gift. Cheques for the winners of cash prizes will be posted in due course. Voters are kindly requested to write their names and addresses clearly while sending their coupons.